A place where I post a photo each day, which you can download and use as a desktop image. These are all my original photos and you are welcome to use them for your personal purposes. If you wish to use them commercially, please contact me. and also part of the Seasons meme. I love purple... and you got three beautiful pictures in my favorite color. I learned a new word today and googled the description! 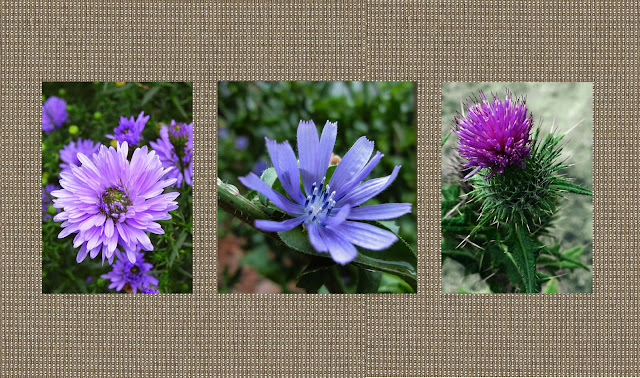 ASTERACEAE, who knew that daisies and thistles were related. Thanks Nick for your wonderful contributions to MM each week. I love blues and purples! How pretty! Many people consider thistles a nuisance, but I love them! This post is part of the Mosaic Monday meme , and also part of the Through my Lens meme , and also part of the Seasons meme . This post is part of the Skywatch Friday meme , and also part of the Friday Photo Journal meme . On its way to work... This post is part of the Saturday Critters meme , and also part of the Camera Critters meme . This post is part of the Saturday Critters meme , and also part of the Camera Critters meme .